* A Collection of 25 Professionally Recorded Videos - This complete video series will teach you everything you need to know about working with cost per action marketing, from getting accepted by the networks, to how to promote your offers. * Why You Should Do Cost Per Action Marketing - Before you take one step further, I want you to understand the advantages of cpa marketing, so you can best take advantage of them. * The Top CPA Networks - There are tons of cpa networks out there, Ill share with you the best ones to get started with. * How to Apply and Get Accepted to a CPA Network - Getting accepted doesnt have to be difficult, you just need to know what to do, and how to present yourself. This video series will prepare you for your interview. * How to Develop a Positive Relationship with your Affiliate Manager - It is highly recommended that you develop a relationship with your affiliate manager, as this is a person that can help you greatly. I will show you how to do this effectively. * How to Find a Niche and an Offer - Follow along with me as I show you how to find the best markets and offers to be targeting. * How to Spy and Get Ideas from your Competition - There is no need to reinvent the wheel, I will show you how to spy on your competition, to help you get your promotions on the right track. * How to Analyze Your Offers Salescopy Effectively - I will show you how to review your offers salescopy (that is in most cases very very good) and pull the best qualities from it for your own marketing purposes. * Ways to Market Your CPA Offers - I will show you seven powerful ways to promote CPA offers. This includes pay per click marketing, article marketing, twitter marketing, and more. * How to Track Your Statistics - I will show you how to track your offers, so you can cut your losses when appropriate, and rinse and repeat your winners to make as much money as possible. 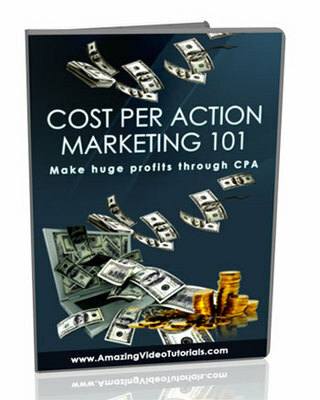 Bonus: Cost Per Action Marketing 101 - This 21 page book is jam-packed with tons of great information on how to get started with cost per action marketing. It supplements the videos. Beginner's Guide To Pay Per Click Affiliate Marketing - Plr!